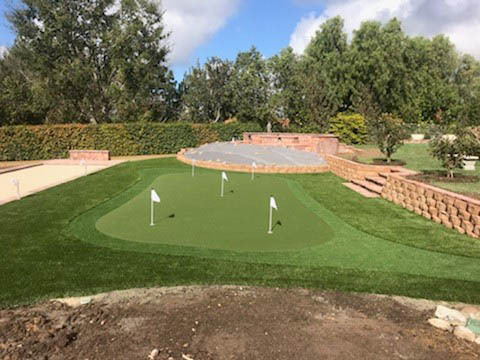 Synthetic Turf International dealer, Keith Thykeson of Pioneer Synthetic Turf Company, recently finished an impressive project in a Camarillo, California back yard. Pioneer Synthetic Turf has been a part of the STI Team as a dealer in Southern California for over 15 years. Pioneer specializes in designing and installing premium synthetic turf projects, ranging from golf course driving range tee lines to putting greens, lawns, playgrounds and all-purpose athletic facilities. 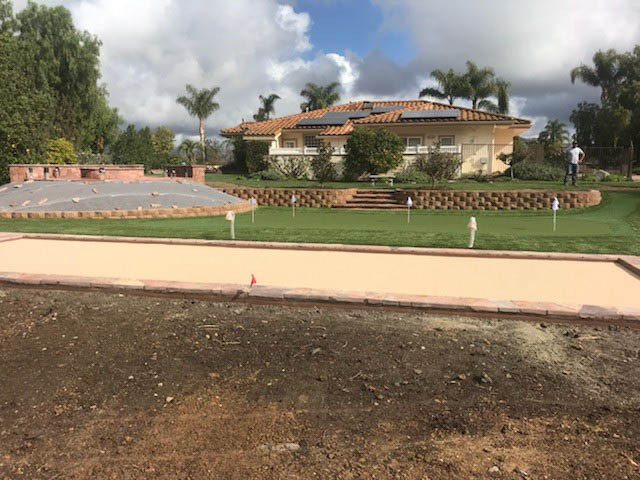 This install features Synthetic Turf International’s product Bocce Pro for the bocce court, with a putting green featuring NP 50, SoftLawn® Kennel Cut, and SoftLawn® Bluegrass Blend. The entire project was approximately a 2,000 square feet. Bocce Pro is one of our most popular and versatile surfaces. Because the Oyster/Tan yarn combination resembles an Oyster shell bocce court, this is the preferred turf product for bocce courts across the country. Since there is no need for infill, it is a great choice for indoor and portable applications. SoftLawn® Kennel Cut, our premium artificial grass for dogs, is an excellent product for commercial and residential pet facilities, with a thatch layer for added body, reducing the amount of infill needed. The four-color blend of this product provides an authentic look and feel that resembles a natural lawn. SoftLawn® Kennel Cut can be used for landscapes, putting green fringes, and playgrounds. The NP50, a putting green turf, is the premier texturized nylon putting surface available in the industry. There is no comparison to the natural ball roll and realistic speeds. The key to the unmatched performance characteristics offered by the NP50 are attributed to the dense, non-directional cross-stitched construction. Numerous teaching professionals, top rated golf facilities, tour players and avid golfers alike prefer this synthetic putting surface. If you are looking for the highest quality synthetic turf-putting surface on the market, look no further than NP50. This turf performs best with the high-end ceramic infill offered by STI, but this product can also be used without infill, which makes it an ideal indoor/portable putting surface. SoftLawn® Bluegrass Blend, a premium synthetic turf for lawns, is an excellent landscape product, with a thatch layer for added body, reducing the amount of infill needed. The four-color blend of this product provides an authentic look and feel that resembles a natural lawn. Bluegrass Blend can be used for landscapes, putting green fringes, playgrounds and pet areas. For more information about our dealer opportunities for synthetic turf, visit here. Contact us today to Experience a Greener World Today!